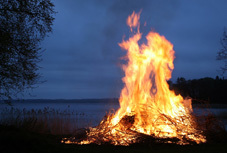 In the Nordic countries there is a tradition of burning large fires in the late spring, to usher in the arrival of summer. Where this tradition comes from, and how old it is, is unknown to me as I write this, but most likely it is a combination of pagan and early Christian practices. In Sweden, April 30th is Valborg’s name-day – Valborg is an old nordic pagan name – and since that is today – I wish all of you visiting here: Happy Valborg! The fourth and last movement of Guitar Pastime Suite is now much delayed under way, and will be published here upon completion.